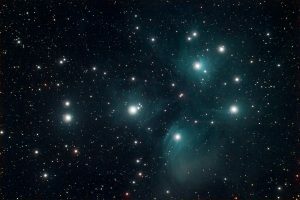 Another image taken at Kelling Heath Star Party – M45, the Pleiades in Taurus. This is the closest star cluster to us, and glows blue with the young stars, embedded in whispy nebulosity. Captured in 2015, but only now am I happy with the processing. It consists of 60 mins of 10-min subs (my longest subs ever! ), with the modded Canon 1100D. Taken through the Starwave 102ED mounted on the HEQ5, and guided by the Lodestar through my 10×60 Altair finder-guider. Stacked and calibrated in Maxim DL, and post-processed in Photoshop and Lightroom. Again, I’ve recently been going for a more natural look, even if it means slightly less nebulosity being visible. I’m trying to avoid the over-processed look these days!